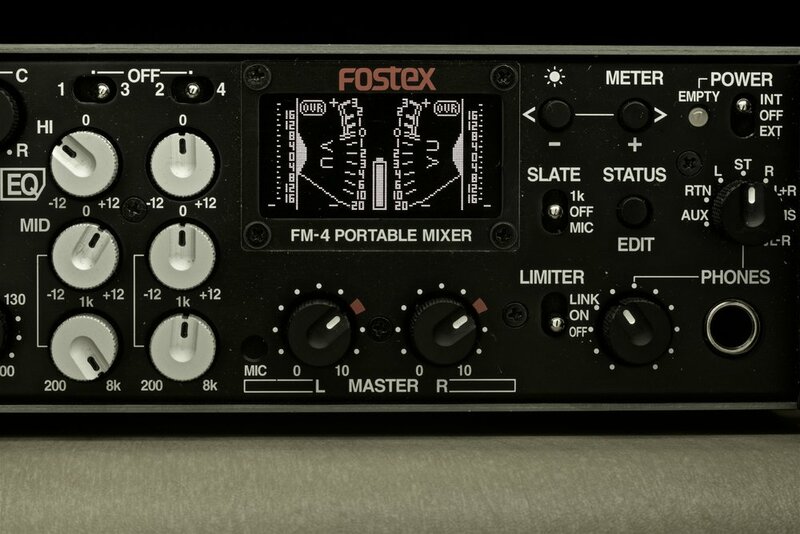 Between the exchange rates in Australia and having a good dealer here in Sydney, I've ended up with a variety of Fostex gear in my studio. 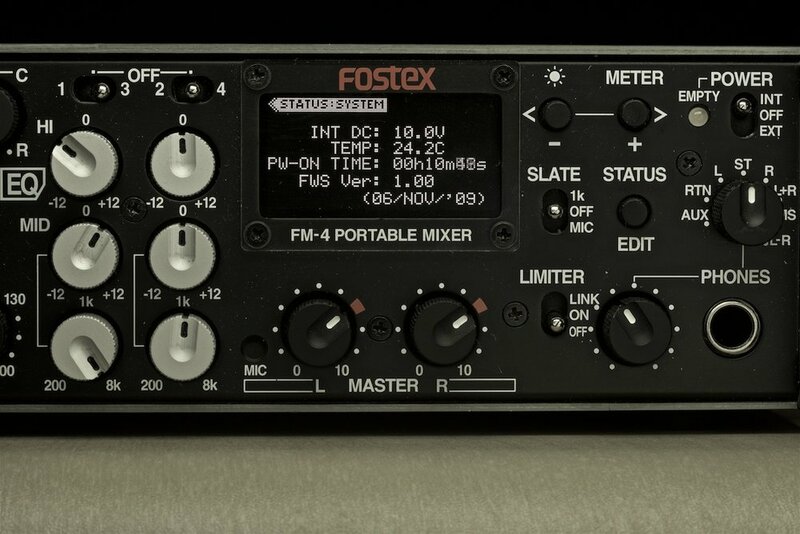 I tend to do a lot of research prior to purchase, but it's often difficult to find much commentary online regarding Fostex equipment in use. So I thought it might be worthwhile to write a bit about my experiences with some of this kit. The first two items are the FM-3 and FM-4 field mixers (the FM-4 is from work; I purchased the FM-3 myself when the dealer had a demo unit at an unbeatable price). Both units are physically and technically similar with a few significant differences. The cosmetics of Fostex gear has, in the past, been—distinctive; let's just say that functionality apparently won over aesthetics. That's not to imply their gear was not well built; I have seen Fostex equipment running along smoothly many years after the expected use-by date. But they took things up a notch with both these mixers. They are very well machined and put together (externally and internally). I expect many years of solid service from them; I take good care of my gear and don't work in extreme environments but I would imagine this kit would also stand up well to rough use as well. The layout is logical and easy to comprehend (though, granted, it's laid out like most professional mixers in this regard; if you have a basic understanding of signal flow, you'll be able to pick either unit up and have it working in a few moments). There are some 'set and forget' features in the on-screen menu; but most functions are modified by physical switches and knobs. I find this reassuring in actual use as I don't want to fiddle with menus in the middle of a live broadcast. All the controls are very well thought out with recessed dials to set and lock; the main gain and volume dials are well dampened with a useful tactile references (always welcome as I'm often working in poorly lit environments). All the standard inputs are accepted through the three or four Neutrik connectors (XLR only not the XLR/TRS combo; I suppose if one dearly needed TRS the connectors could be readily replaced as they are a standard fitting). In addition to line level, dynamic, and P48 they've also included T-Power which is a pleasant bonus for professionals using the few remaining or older T-Power microphones. Note that both units provide a solid P48 feed to all mics. I have run these in the studio powering multiple large diaphragm mics at once with no issues at all. Granted, that's been with an external 12v power supply, but the internal battery also seems to provide adequate power for extended times. With dynamic or line level inputs, the batteries last all day. On the subject of power, both units share a nicely designed caddy that holds 8 AA batteries. I have them loaded with NiMh rechargeables (there is an option in the menu to give accurate battery readings for either alkaline or rechargeable). The caddy is a welcome departure from other designs which required the user to remove a double handful of AA batteries from the unit itself. This is frustrating in the field in the middle of a recording or standing outdoors, etc. Instead, I have several loaded caddies in the bag and can just quickly exchange them. There is also a door on the unit itself that closes over the battery cavity if none is loaded. Quite tidy. Also, kudos for sharing the same caddy for both units. Normally though I'm using these units in the studio or in a location setup with power. In that case, I plug in a heavy duty 12v power supply. Both units have a standard professional four pin power connection (as well as a Hirose DC out for ancillary devices). I can't stress how much I wish more gear had this standard connector. It's a given, in professional environments, that one will connect and disconnect the power thousands of times over the life of the unit. I have had multiple failures of the little consumer barrel connectors that are too often used. Moving round to the front, we have the control surface. This is similar on both units. Obviously the FM-3 only has three channels; however, it also loses continuous channel panning (has a L-C-R hard switch instead) as well as the tone controls of the FM-4. I find that I don't use the EQ much in the field unless it's in a live setting and I'll not have the opportunity to EQ in post. You can only EQ two individual channels at a time anyway so it's more of a problem solver than an everyday feature. 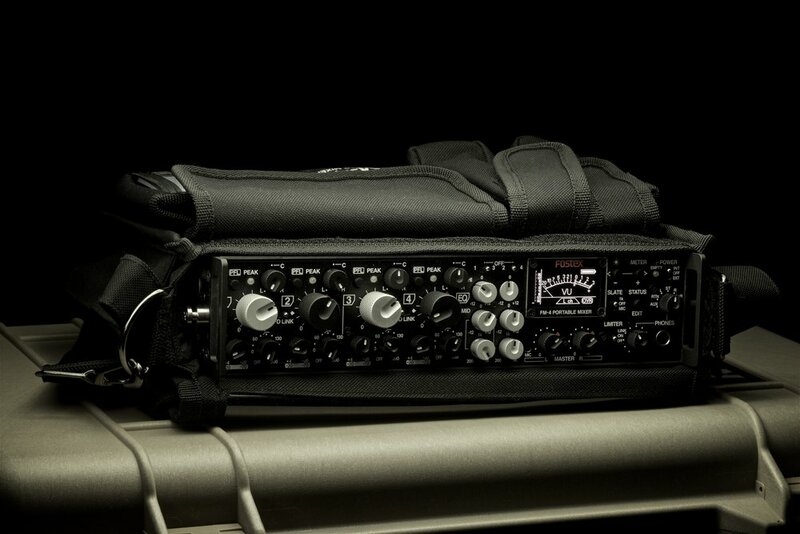 Both units provide plenty of gain with all but the most dense dynamic mics. Any powered mic I've put through has come through with gain in spades. All channels are very clean and clear of any hint of hiss or distortion (I wouldn't hesitate to use either unit for detailed music recordings though most of what I do is speech). Both units have the standard set of slate and monitoring controls (including basic MS mix in the headphones). They've included useful little things like a locking slate switch; instead of a momentary contact, you can turn on a 1k tone and keep it going whilst setting levels down the line. The headphone path is...adequate. It's built more for power than nuance; I can drive any pair of headphones I have (or two pair as there are two headphone jacks); however, it's not the quietest headphone amp in the world. This is something that I wish mixer manufacturers would not skimp on as I would like to hear exactly what I'm recording. I know there must be some trade off between power and detail for this though. My FM-4 did have some noise issue with the headphone amp and, after repair, it sounds far better (better than the FM-3). I have a feeling that the dealer here replaced a part with one having a superior spec to the original. The menu system isn't often accessed as it's where one sets some level and routing parameters as well as safety features (one can turn off T-Power to avoid the risk of damaging dynamic or ribbon mics). The limiter on both units is quite good and can be set to a soft curve or something a bit more aggressive. The menu also shows the current routing diagram of the main bus; however, that's all apparent from the setting of the switches on the side of the unit so I'm not often looking at that. Now, on the menu, here is my one significant gripe with the whole design—the display screen. It's too small, too dim, and too low resolution; there is just no getting round that. If it were just for the menu options, that would be fine. However, it's also used for metering—one of the most important visual interface functions of a mixer. You can switch between showing a full screen Left or Right or showing both L/R simultaneously. Also, it's good that they include both peak and VU metering, but having it all on the little screen all together makes for squinty viewing on the go. I'd really much rather have an old fashioned analogue VU meter with a basic LED bar of peak indication. It's also (again, in Australia) difficult to see this display in bright sunlight (as opposed to the SoundDevices mixer I have which I have to turn down to avoid lighting up the room indoors). This isn't an altogether write-off for the units but you should carefully consider under what circumstances you'll use the kit. Both units have a comprehensive output section which makes them useful for a variety of routing needs. I'm often needing to route to different recorders and/or send a line feed for live sound at different levels. 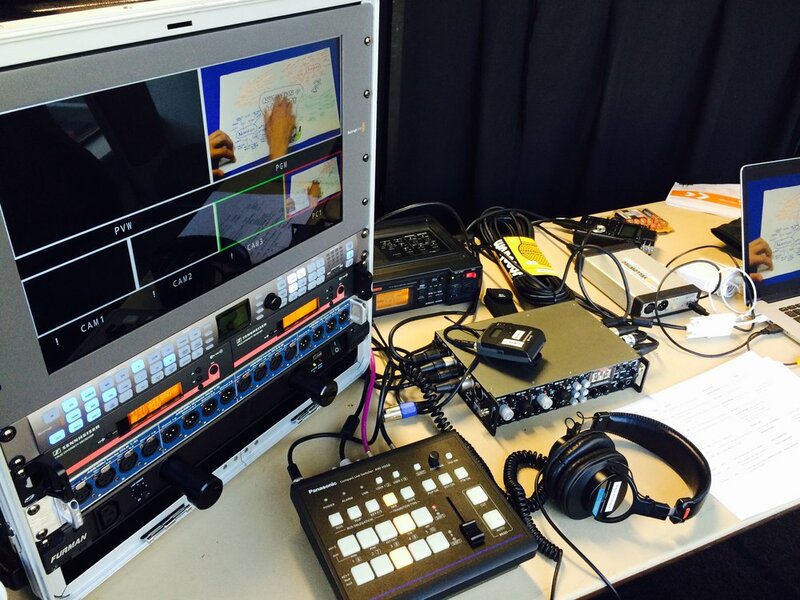 The FM-4 also allows one to send a 'straight' feed 4-in/4-out. I sometimes use it as a pre-amp head in the studio to send four line level outs to my audio interface when I run out of mic-pres (the FM-3 is just two channel out as there isn't space on the panel for individual outs for all three channels). I do have a five pin cable to daisy chain the units together. This feeds the output of the FM-3 straight into the bus of the FM-4 giving me seven channels mixed down to stereo or mono. I rarely use this but it can be a handy feature if I'm out somewhere and don't want to haul out a large desk mixer when I just need a few extra channels. Altogether, both units are well built, sound great and are worth looking into if you can find them on the used market. I just wish Fostex had continued with the line and kept improving it. There is, internally, even a connection for a A/D convertor card. I checked with the dealer here who said that was a planned expansion that just never made it to market. I would love to have this as a mic-pre with AES out! Alas; not to be.